Granite stones from Skärholmen quarry, wood, text, c-prints. Installation view from Botnik Studios, Gerlesborg, Sweden. 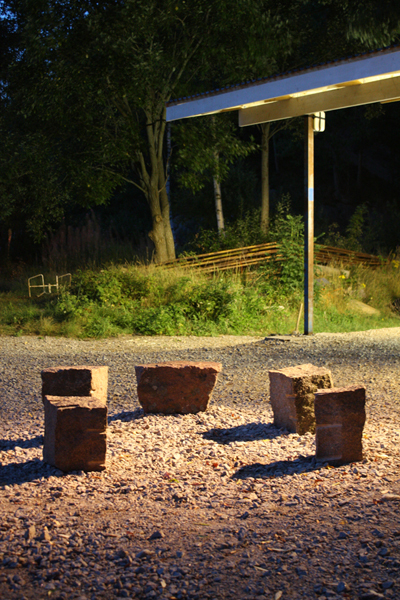 Unrealized Ruins is a seating sculpture composed of five granite stones transported from the nearby quarry to the exhibition space Botnik Studios where they are placed in a sircular seating arrangement. The stones are partially carved and were left at the quarry since when it was shut down decades ago. Stones from several quarries on the west coast of Sweden were part of a large scale order issued by the German architect Albert Speer just before the second world war for the construction of Hitler's Third Reich. There was not sufficient stone in Germany to fulfill the plans of the massive building project, so it had to be ordered in from abroad. Hitler requested especially the use of granite because this type of stone had a so-called "ruin value". The theory of ruin value was that the use of material such as granite would mean that when the buildings over time became ruins one would still recognize them as the magnificent monuments they once were, as opposed to the use of steel and concrete. However, as Hitlers plan failed, huge amount of stone were left at these quarries. Some of it was resold, but some of it is still left at the quarries and are known as “Hitlerstone”. The signes behind each stone shows sketches of some of the buildings that were planned for the Third Reich. Included in the installation is an old map on which the shipping route for the stones from Sweden to Germany is marked in. Granite stones from Skärholmen quarry, wood, text, c-prints, map. Installation view from the exhibition Botnik Space Off at Botnik Studios, Gerlesborg, Sweden, 2008.